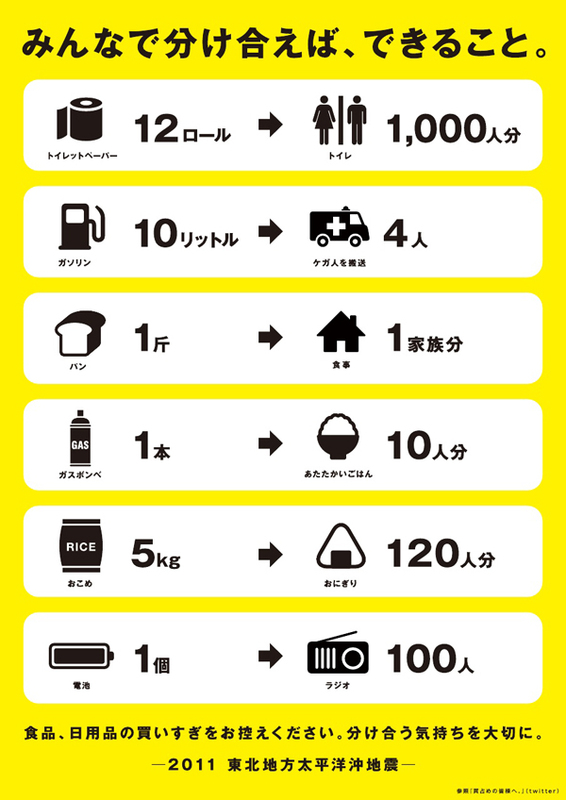 This infographic speaks loud and clear to the needs of Japanese people affected by the earthquake and tsunami, even if you don’t know their language. It is an instance of image as public service. Most news networks keep running the same 4 or 5 extreme damage loops focusing on the body count and tragedy … to repeat them with music and logos is sickening, and now Japan has become the lead star in American news network Natural Disaster Series. There are also positive developments that keep hope and humanity alive and together. The media produces yellow journalism when their storytelling is more narrative-driven than information-driven, overdramatizing a grave situation through fear. David McCandless, author of The Visual Miscellaneum, tracked instances of media scare stories in his graphic “Mountains Out of Molehills.” In those cases, potential threats were discussed in hysterical terms, but never fully materialized. Public health campaigns harness fear, not to exploit their citizens, but to deter them from unsafe behavior. Though well-intended, they may tap into stereotypes to make their points. This U.S. Public Health Service poster from the 1940s targets STD-prevention—and loose women. When it promotes sexism and racism, does fear-mongering do more harm than good? Brooklyn artist True substituted life-affirming messages for bland instructions in his subway sticker installation series, posted in 1994 and seen through 1999. Both artists used information graphics to “keep hope and humanity alive and together,” not to confer a mantle of false authority on official messages that may be biased and uninformative.